It could well be that anyone from the coastal districts of Scandinavia has had more than enough of people making silly stereotyped comments about the Vikings writes W M Nixon. But the reality is that when it came to boats, the Vikings really were in a league of their own. And when that Viking maritime heritage has been transferred down the ages into a modern powercruiser which is well able for the challenging waters off the west coast of Norway, we in Ireland should take notice. For although there’s no lack of sunny images projecting a picture of Norway with a gentle sea, we know in Ireland that such photos will be readily available from the usual sources to portray our own waters too. Yet on our home waters, we know fine well that any serious boat going along the Irish coast has to be ready to take the rough with the smooth. And that’s also the way it can be in Norway, even with all those sheltered leads inside the myriad islands. So a 26ft powercruiser from a solid Norwegian family firm based on an island off Bergen, with a tradition going back to 1966, for sale on Afloat Boats for Sale, deserves favourable attention. 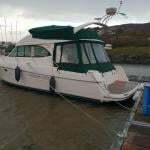 And this Viksund St Cruz 260 for sale in Wexford (yes I know the place has a Viking name, but even BoatBlogger has his limits) becomes more interesting the more we look at her. (Above) The Viksund 260 off the ancient Viking port of Wexford. Sea-keeping ability is a Viksund priority, and that is emphasised in the hull design, which can reach 18 knots when the 150hp Volvo diesel is flat out, but a cruising speed of 14 knots keeps things manageable, and the good sense of the hull shape is well able for a variety of conditions. That said, the boat will blossom in good weather, and the cockpit/accommodation layout leans towards this, while providing overnight accommodation for three. The Viksund 260 is a sensible compromise between the needs of seaworthiness and the hope that the weather Gods are going to send a day reminiscent of the Mediterranean at its sweetest. This well-equipped 2002 model is priced at €49,000 through Leinster Boats. See the full advert here. It tells us much about the intrinsic quality of a boat if her looks don’t seem to date writes W M Nixon. The debut of the Dufour 40 Performance in 2002, as the result of an interesting design linkup between Umberto Felci and Patrick Roseo, drew a telling level of interest from discerning sailors. They saw a carefully-planned boat which didn’t look outrageously modern, yet had a certain quality which suggested she still wouldn’t look dated twenty years hence. Fifteen years ago, one of the most experienced and thoughtful sailors in Cork decided that here was the dreamship, and by 2003 his new boat was in Crosshaven. She demonstrated with a lively mixture of family sailing, white sail racing and cruising, that she was everything the pundits expected, and more. Sadly, that first owner, one of Irish sailing’s great life-enhancers, was taken from us all too young. It was felt that selling his beloved boat away from Crosshaven would ease the pain. Yet such had been the friendly effect that this boat had made on everyone with her first owner that, as a mark of respect, the new buyer on the East Coast retained the track on the chart plotter of his final year in his beloved Cork Harbour. Now, that second owner has realised that the years are passing, and he has a fascinating new line in boat ownership in mind, a completely new track to mark the passing of a landmark birthday. So this dreamship is for sale for only the second time, and at the very sensible price of €89,500. The layout allows for the forward stateroom to be completely en suite. I’ve had the pleasure of going to sea on her, and she’s as good-natured a boat as you’ll come across in many a day’s sailing, while having an unexpected yet very real oomph in her performance, which makes a spot of racing unexpectedly rewarding. But in the bigger picture, undoubtedly she’d give of her best with well-planned and maybe extensive cruising based on a judiciously-balanced programme between longer hops and detailed visits to intriguing ports. She handles a treat under sail or power, and has enough assisted gizmos to make the prospect of a quick evening jaunt after a harassing day at the office just the ticket to revive the spirits. As I said, that much-missed first owner was a noted life-enhancer. I think this boat is too. 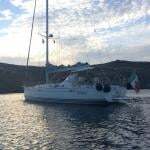 She comes very highly recommended, full details on Afloat.ie's Sailing Cruisers for Sale here. The five–times National Championship winning clinker–built Mermaid Zuleika is for sale. Built in 1996 by Des Tyrrell the Derek Joyce owned and skippered dinghy was fitted with a new deck last season. Priced at €16,500 the boat comes with many extras including a trailer. But it mustn’t be a glossy and bulbous machine which critics – themselves included – would dismiss as a gin palace. On the contrary, their ideal is a boat with a discreetly workaday character, a boat clearly related to pilot boats and patrol vessels and the like. At the upper end of the size scale, the pace was and still is set by the Keith Nelson type. But the Nelson boats seem to work best when they’re more than 30ft long. Below that size, however, it’s the Seaward range which increasingly dominates, and the Seaward 23 has carved out her own niche in this very positive segment of the market. So much so, in fact, that it’s almost enough to say that a Seaward 23 is the pet boat of one of Ireland’s most distinguished senior sailors, a nonagenarian who in his peak sailing days was several times Helmsmans Champion in addition to winning many major titles inshore and offshore. If the Seaward 23 is good enough for him, then she should be good enough for the rest of us. His particular model is twin-engined, but this 1986 version for sale via Afloat.ie in Mullingar at €17,000 through Leinster Boats is single-screw with a 45hp BMW D-50 diesel, which is more than adequate power for most uses. And having one engine makes the cockpit much more commodious. In a boat just 23ft long, the fact that there’s a substantial coachroof/wheelhouse already taking up much of the hull gives added importance to any extra space which can be provided by the cockpit. While the demo boat whose photo heads this article had not yet been fitted with a proper cockpit tent, the one in Mullingar comes with it in place, and it means the roomy cockpit is in effect a third cabin. She’s a notably seaworthy boat, she provides full overnight accommodation for two with a proper separate toilet/washroom, in good summer weather you might even be able to set up an extra bunk or two in the cockpit, so she offers the best of both worlds between day cruiser and weekender - and all in a very manageable size package. This is the time of year when boat-owners can no longer push to the back of their minds the thought that some bits of equipment aren’t working quite as well as they should, while others maybe aren’t working at all writes W M Nixon. It’s amazing how much cruising or day sailing you can do with some item of gear not doing its fair share of the work. But against that, there’s nothing which quite compares with the quiet satisfaction of knowing that everything has been serviced as and when it should be, where renewal was required the job was done on time, and that this is how it has always been with the boat involved. Clearly, the private vendor of this Bavaria 36 yacht for sale in Dun Laoghaire understands this mind-set very well indeed, for as he says himself, this boat is well-presented. In fact, you could take it all as the very model of how a boat should be offered for sale at this time of the year, as the first hint of a stretch to the evenings starts to get those sailing juices flowing again. A handy size – the Bavaria 36 for sale in Dun Laoghaire is the three-cabin version. The Bavaria 36, when it appeared in 1998, virtually defined an unmistakably German brand. Sensible, no nonsense boats which offered oodles of room, yet they can turn in a surprisingly nippy performance with genuine pleasure in the sailing. There’s something about the Westerly Griffon 26’s determined dedication to simplicity which gives this little sloop designed by the late Ed Dubois a certain style writes W M Nixon. For starters, describing her as “little” seems immediately inappropriate, for if ever the phrase “big-hearted” was on target, it’s right here on a 26-footer which proves to be a genuine family cruiser, yet with a surprisingly zippy performance. An example of this sailing cruiser is currently for sale on Afloat.ie here. But then, that’s what you’d expect from a designer of wide-ranging talents who went on to include the overall winner of the 1987 Fastnet Race, the Dubois 40 Irish Independent, among his many successful creations. For the Dubois 40 was yet to come when he first sketched out the lines for the Westerly Griffon in 1979. Yet at a time when boats were tending to become larger, this gallant craft punched above her weight to such good effect that the Westerly Griffon 26 Mark I stayed in production for three years with 329 boats being built, following which the Mark II was introduced with an up-graded interior. The real Griffon aficionados tend to reckon there’s something more genuine about the Mark I, so this boat will be to their taste - as a 1980 boat, she’s plumb in the middle of the initial production line. However, dedication to having everything original has its limits, and your Mark I devotee will be pleased to note that this dark blue version had a new more powerful 20hp Beta Diesel fitted in 2009, which makes sense in every way. She’s realistically priced at €9,950 with Crosshaven Boatyard. And for those with pre-conceived notions about a 26-footer being a decidedly small boat, be prepared to be pleasantly surprised. Read More on Westerly Griffons here. In her day – which began in 1973 – the John A Bennett-designed Colvic 31 received deserved admiration as the kind of motor-sailer, complete with a proper deckhouse, which any sailing enthusiast thinking about moving into more comfortable boat territory could seriously contemplate writes W M Nixon. The boat is advertised here among the popular listings on Afloat Boats for Sale. And at their lovely old world boatyard of Kilmacsimon, set among the trees on the west side of the estuary between Kinsale and Inishannnon, George Kingston and his team created a particularly good version, the Simon 31, based on the Colvic hull and deckhouse, but with lots of clever Kingston touches added. The result was an able yet unostentatious boat which suited the average Irish summer very well. The fact that we’re in a summer which is even more average than usual will make this 1980 version of interest for people who wish to continue cruising, preferably with a bit of sailing thrown in, but are fed up with having to haul on and haul off the foul weather gear several times a day. For sure if the weather’s fine, you can helm this ketch from the cockpit. But there’s an equally well-serviced helmsman’s station at the forward end of the roomy deckhouse, and if the weather turns foul you can trundle comfortably along under that most accommodating of rigs, the engine at gentle revs with headsail and mizzen pulling well and the main neatly stowed. With her full draft of 4ft, she certainly has sailing capability. As for her general roominess, it’s astonishing – this is one very big 31 footer. And her looks are handsome, speaking eloquently of practicality. The price of €19,950 is realistic, for as some of the photos show, she’s beginning to show her age in a few areas, and experienced advice would probably have it that an engine replacement might be in order. But a fairly heavy classic diesel like the Thorneycroft BMC can go on for a very long time, for if I remember rightly, this is the marinised version of the engine developed for London taxis, so not only is it bullet-proof, but replacement parts are very competitively priced. As to sea-going capability, the Colvic 31 motor-sailer was the boat used by cruising author Wallace Clark for the ventures of his latter years, in one of which he was awarded the Irish Cruising Club’s Rockabill Trophy for Seamanship. This was in recognition of his skill in bringing his Colvic 31 through the appalling tide-rip which can develop off the Mull of Oa, the southwest corner of Islay in the Hebrides. As he cheerfully admitted, it was his own mis-timing of tides which resulted in his being somewhere he shouldn’t have been next nor near in the first place. But the way in which his little boat came through, battered and bedraggled but triumphant, was a credit to John Bennett’s very sensible design.